Leinelä was ranked as one of the most desired new residential areas in Finland in a survey carried out by Taloussanomat. This unique art district is located centrally in Vantaa, next to the Ilola and Asola low-rise residential areas. Leinelä was ranked as one of the most desired new residential areas in Finland in a survey carried out by Taloussanomat. This unique art district is located centrally in Vantaa, next to the Ilola and Asola low-rise residential areas. Leinelä offers good traffic connections to shops, schools, leisure activities and anywhere in the world. Leinelä is made unique by the area's environmental art. The City of Vantaa had an overall plan for art already in the planning phase, with artist Vesa-Pekka Rannikko responsible for the plan. The principles of the art merging with the surrounding nature include accessibility and a multi-sensory nature. The area also features works of art by Anni Laakso, Hilda Kozár, Demis Ziegler, Vesa-Pekka Rannikko, Markku Pääkkönen and Heimo Suntio. 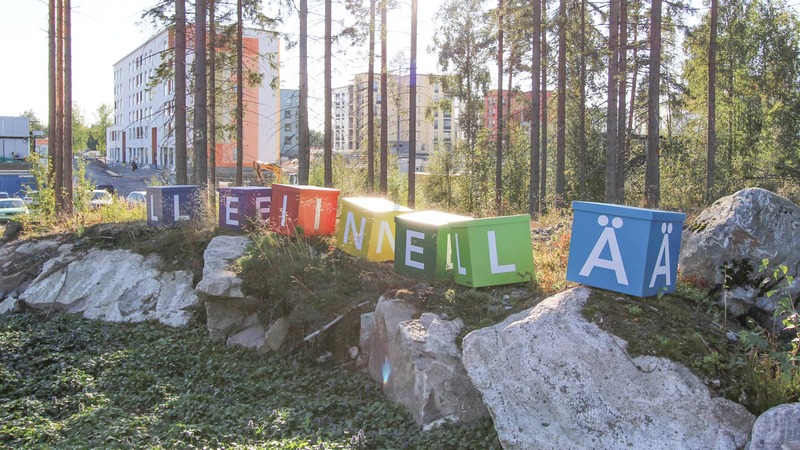 The works of art are a genuine part of the everyday lives of the area's residents, such as Anni Laakso's merry "Puunhaltijankolo" on the yard of a day-care centre – it is a sculpture inside of which children can play. There are primary and upper comprehensive schools close to the area in Simonkylä and Ilola. Leinelä's own day-care centre was opened in January 2011 and the construction of a second one will commence towards the end of this decade. There are more day-care centres less than a kilometre away. Leinelä will have its very own grocery store in autumn 2017, when Alepa opens by the central square. Located less than a kilometre away, there is an S-market grocery shop and the K-Citymarket shopping centre in Koivukylä with almost 3,000 square metres of specialty shops and cafeteria and restaurant services. The Jumbo shopping centre is located a ten-minute drive away, and the Flamingo entertainment centre next to it is a good recreation place for the entire family with its spas and movie theatres. The closest healthcare centre is located under a kilometre away, and even Peijas Hospital is only a few kilometres away. Nature is present everywhere in Leinelä, and the area offers good opportunities for sports. The Metsänhenki and Kukkukallio park areas are already complete, while the Epinkoskenpuisto park is under construction. Nature has been preserved exceptionally well during the construction of the area. There are comfortable walking routes crossing the area, offering outdoor activities directly from the new homes. In the wintertime, the skiing tracks in the area encourage you to go skiing, and the Kuusijärvi outdoor centre or the Sipoo wilderness area are not far, either. The largest sports centre in Eastern Vantaa, the Tikkurila Sports Park, is located less than three kilometres away.